Shattered Mural, a floor installation of forty-three sculptural fragments that reference the abduction and murder of the 43 college students in 2014 in the southern Mexican state of Guerrero. This tragic event became an international symbol for victims of institutional corruption and repressive regimes around the world. The individual fragments of Shattered Mural were created by deconstructing a mural (painted with acrylic paint on wood) into forty-three shards that when put back together would contribute to the whole. Unanimously three judges from the First Collegiate Tribunal of the 19th Circuit stated that a new investigation on the disappearance of the 43 students from Guerrero, Mexico must take place. To learn more about the ruling and the case, please visit the NY Times article here. 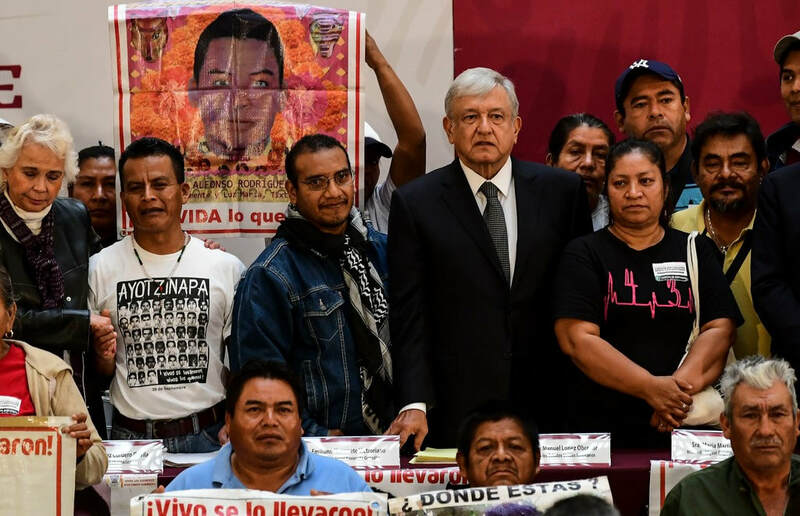 "President Andrés Manuel López Obrador of Mexico created a truth commission on Monday to re-examine the case of 43 students whose disappearance in 2014, still unsolved after a disputed investigation, has come to represent the tens of thousands of Mexicans who have vanished in more than a decade of the drug war." To learn more on how the commission will investigate the disappearance of 43 students , please visit the NY Times article here.